Two fine Southern writers have teamed up on a couple of ambitious new projects, and the enterprise needs some explaining. Katherine Clark‘s first book was Motherwit (1989), an as-told-to biography of midwife Onnie Lee Logan. Then Clark published Milking the Moon (2001), Mobile writer Eugene Walter’s life story, again as-told- to. These books attracted the admiration of Pat Conroy who has now told HIS life story to Clark, in face-to-face interviews and daily over the telephone, the volume to be published next year. In the meantime, as if the author of The Prince of Tides, The Great Santini, and nine others weren’t busy enough, Conroy has become the series editor of Story River Books, novels coming out of the University of South Carolina Press. 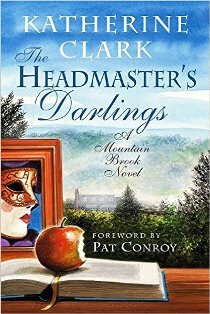 Clark has, most unusually, even unbelievably, written a quartet of novels set not in exotic Alexandria, as were Lawrence Durrell’s, but in Mountain Brook, Alabama. The first of these, The Headmaster’s Darlings, is just out and is first-rate. Clark, a native of that enclave of privilege, attended the Altamont School, here called the Brook-Haven School (and later Harvard), and was clearly paying close attention. In his Foreword, Conroy recalls teachers important to him, the men and women praised in Conroy’s My Reading Life, a remarkable memoir, and he says Clark’s protagonist may be even more impressive. Conroy also pays the highest compliment to a book of this sort—a comedy of manners that depends so heavily on the observed detail: “What she has done is create a world” in the way that Dickens created London for his readers or Saul Bellow created Chicago. The Headmaster’s Darlings is set in 1983-84. The protagonist, Norman Laney, is modelled closely after Carl Martin Hames, the larger than life, in fact 600-pound, theatre director and teacher of English and art history. Hames’ photo even appears among the front matter. In the novel, Laney is Falstaffian, Gargantuan, huge, but, hiding in plain sight, he is a subversive force, an agent inside enemy lines. Originally from blue collar Pratt City, Laney teaches in Mountain Brook but is not of it. He lives in one of the few apartment buildings in Mountain Brook, a building usually occupied only by “the newly-wed or nearly dead.” Real people live in nice homes. Many parents would think this to be meddling. They don’t know the half of it. Laney can see what a youngster is struggling to be, and encourages this, even if it means coming out as gay or something really bold, like becoming an artist. Surprisingly, he also urges these “escapees” to return afterwards, if they can, and then work to “civilize” their home place, even to go so far as joining the Junior League to make it the service organization it ought to be. Some, no matter how wealthy, won’t be accepted because, alas, they are “outsiders.” Laney muses: in the typical Mountain Brook mind, everyone not from here, even someone from Idaho, is a Yankee and all Yankees are Jews. Ipso facto, all those not from here are Yankee Jews, not socially acceptable. Certain plot lines are set in motion in this novel which, remember, has at least three sequels. Unspecified charges of misconduct are brought against Laney. A mother of one of his students dies under inexplicable circumstances. These threads will be followed in the books to come. One wonders how all this will go down with readers in Mountain Brook. On the one hand, after Thomas Wolfe wrote Look Homeward, Angel, Ashevilleans were furious and Wolfe famously wrote You Can’t Go Home Again. On the other hand, the objects of ridicule rarely recognize themselves. The figure being lampooned is someone else, in the house down the road.